The serotonin signalling system plays a key role in the modulation of bidirectional brain-gut interactions involved in cognition, emotions, emesis and digestive functions. Although alterations within the serotonergic system are assumed to contribute to conditions like irritable bowel syndrome (IBS) and eating disorders, its role in their pathomechanism still remains enigmatic. Patients often concomitantly suffer from anxiety and depression. 5-HT3 receptor antagonists are beneficial in the treatment of these conditions, but not all patients respond satisfyingly (Walstab et al., 2010a, Niesler 2011). We therefore hypothesized that 5-HT3 receptor variants may influence 5-HT3 signalling in the brain-gut axis and thereby modify susceptibility to both, neurogastrointestinal and psychiatric disorders. Our research focus in the past comprised the serotonin receptor system, in particular the serotonin type 3 receptor (5-HT3 R) diversity and its role in the aetiology of neuropsychiatric and neurogastrointestinal disorders. In our efforts to elucidate the heterogeneity of 5-HT3 receptors, we isolated and characterized three novel 5-HT3 (HTR3) genes (Niesler et al, 2003; 2007; Walstab et al., 2010b). We have identified HTR3 variants involved in depression and anxiety as well as anorexia and IBS and in individual drug response which may serve as pharmacogenetic and biomarkers in the future (Niesler et al. 2001a;Niesler et al. 2001b;Frank et al., 2004; Kapeller et al., 2008; 2009; Fasching et al., 2008; Hammer et al., 2009; Hammer et al. 2010; Kilpatrick et al., 2011; Hammer et al., 2012). 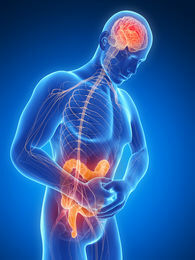 To gain further insight into the pathomechanism of disease and the role of 5-HT3 receptors, we established 5-HT3 specific antibodies and confirmed expression of all 5-HT3 receptor subunits in the human enteric nervous system, 'the little brain of the gut', and the gut mucosa (Kapeller et al., 2011). In more recent projects we were able to show that natural compounds such as ginger, menthol and boldin target 5-HT3A and 5-HT3AB receptors and represent options in the treatment of IBS and to combat emesis and vomiting ( Walstab et al, 2013, 2014). In 2010, we have established the German IBSNet, in which specialized centers from all over Germany collect IBS samples to unravel genetic causes of IBS. We are currently characterising 5-HT3 receptor distribution and composition in the human gastrointestinal tract and the brain in order to identify tissue specific subtypes which we aim to target by microRNAs (transcript level) and specific drugs or antibodies (protein level) in order to establish novel treatment strategies for IBS. 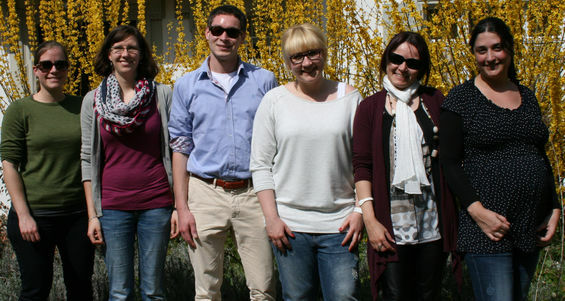 Furthermore, in 2012 we have established the COST (cooperation in science and technology, funded by the European Science Foundation, ESF) Action GENIEUR (The Genes in Irritable Bowel Syndrome Research Network Europe) in order to address the challenge of nailing down genetic factors involved in IBS. In one of the collaborative studies, we were involved in the first Genome Wide Association Study in IBS ( Ek et al, 2014). We furthermore explored the current immunogene SNPs ( Czogalla et al., 2015) and performed Genetic Imaging studies ( Kilpatrick et al., 2011, Orand et al. 2015). Most recently, GENIEUR published a state of the art review on unravelling the genetic basis in IBS ( Gazouli et al., 2016). This and other key contributions to the IBS field were now included in Nature outlook and an online collection on IBS in Nature.